Write a c program to concatenate two strings. 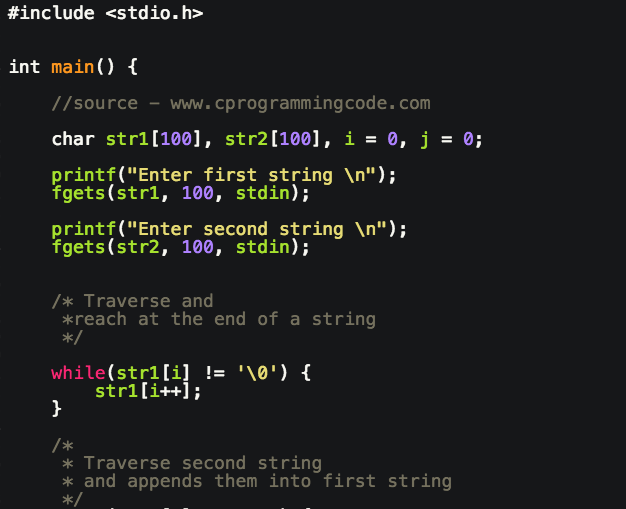 Given two input strings, we have to write a C program to concatenate two strings. In this tutorial, we'll take an example of string concatenation using inbuilt string function strcat() as well as without using this inbuilt method. Logic of concatenating two strings. i) Declare two character array and take input from user. ii) Traverse first string to reach at the end, now start concatenating second string into first. Let's first take an example of string concatenation using inbuilt function strcat(). 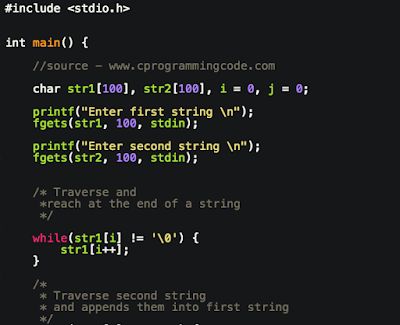 In this example, we take two input strings from user and then concatenate these two strings using strcat() method. In this example, we first traverse a first string and reach at the end of a first string and then start concatenating second string into first string.